Come with me to explore an important place in Church history! On a summer day in 1829, Joseph Smith walked into a red brick building in Palmyra, New York, USA, where Mr. Egbert B. Grandin had a printing press. The Prophet had just finished translating the words on the gold plates, and he wanted Mr. Grandin to publish the first 5,000 copies of the Book of Mormon. By the next spring, the new book of scripture was printed and ready for people to read. 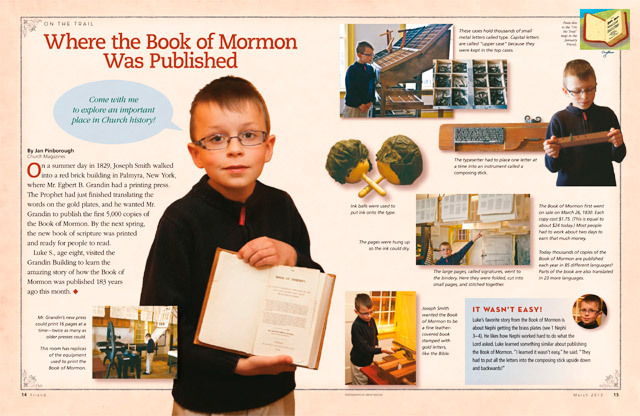 Luke S., age eight, visited the Grandin Building to learn the amazing story of how the Book of Mormon was published 183 years ago this month. Mr. Grandin’s new press could print 16 pages at a time﻿—twice as many as older presses could. This room has replicas of the equipment used to print the Book of Mormon. These cases hold thousands of small metal letters called type. Capital letters are called “upper case” because they were kept in the top cases. The typesetter had to place one letter at a time into an instrument called a composing stick. Ink balls were used to put ink onto the type. The pages were hung up so the ink could dry. The large pages, called signatures, went to the bindery. Here they were folded, cut into small pages, and stitched together. Joseph Smith wanted the Book of Mormon to be a fine leather-covered book stamped with gold letters, like the Bible. The Book of Mormon first went on sale on March 26, 1830. Each copy cost U.S.$1.75. (This is equal to about U.S.$24 today.) Most people had to work about two days to earn that much money. Today thousands of copies of the Book of Mormon are published each year in 85 different languages. Parts of the book are also translated in 23 more languages.